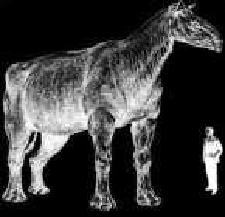 World’s largest mammal that ever walked the face of the earth used to live in Pakistan’s Balochistan province. Yes it is true. This mammal is called Baluchitherium (The Beast of Balochistan). So far the fossils of this mammal have only been found in Baluchistan and Central Asia. 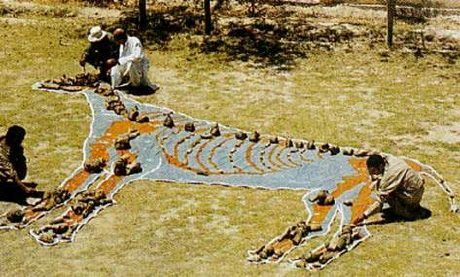 In 1999, a team of French Palaentologists discovered the complete skeleton of this giant mammal in Dera Bugti Hills of Pakistan. The find came as the result of a 5 month long expedition by the French Team in the Balochistan desert. All in all it was a 5 year long on-and-off study. The French team was led by Professor Jean-Loup Welcomme of the Natural History Museum in Paris. While the first complete skeleton of Baluchitherium was dicscovered in 1999, it was as early as 1846 when first pieces of fossilized Baluchitherium were accidentally stumbled upon in Dera Bugti by a British Army officer who went by the name of Vickary. In 1909 another skeleton was found in the same area by a British team led by Mr. Forster-Cooper of the Cambridge Sedgwick Museum. 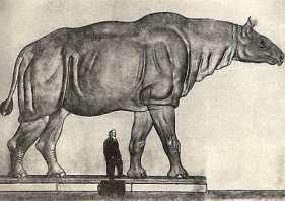 Following photo is a replica of Baluchitherium created for a museum in western hemisphere. 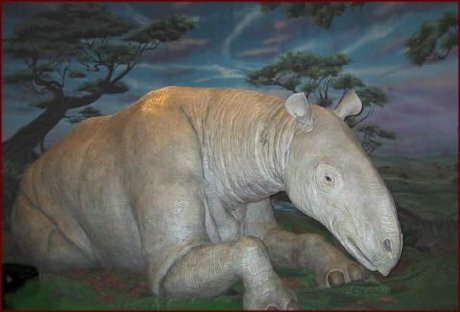 Baluchitherium is an extinct rhinoceros that lived during the Tertiary Period about 20 to 30 million years ago. With its long neck and legs, it was thought to feed high up in the trees. 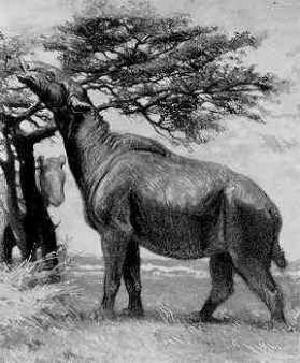 However, unlike the modern rhinoceros, the animal had no horn. 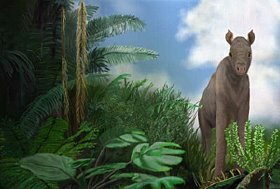 It had an estimated shoulder height of nearly 18 ft (5.5 m), a length of upto 28 feet (from nose to rump) and a weight of about 10 to 15 tons. The head was four feet long, sitting on top of a six feet long neck. This beast had poor eyesight, but made up for this with keen hearing and smell. Baluchitherium is classified in the phylum Chordata, subphylum Vertebrata, class Mammalia, order Perissodactyla, family Rhinocerotidae. Although fossil remains of Baluchitherium have been discovered before, a near-complete skeleton has always evaded palaeontologists. 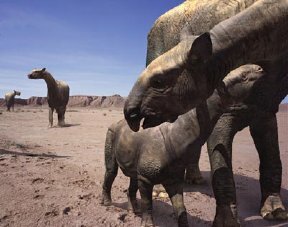 The fact that the Baluchitherium was able to live in Baluchistan is giving scientists clues about the climate in the area millions of years ago. Eventhough Balochistan is now mostly a desert but since Baluchitherium would have needed as much as two tonnes of fodder every day, the French team believes this area of Pakistan must have been heavily forested. It is said that the Baluchitherium was a very defensive animal, and attacked any animal that was nearby. This beast tried to charge and trample foes with its front feet. 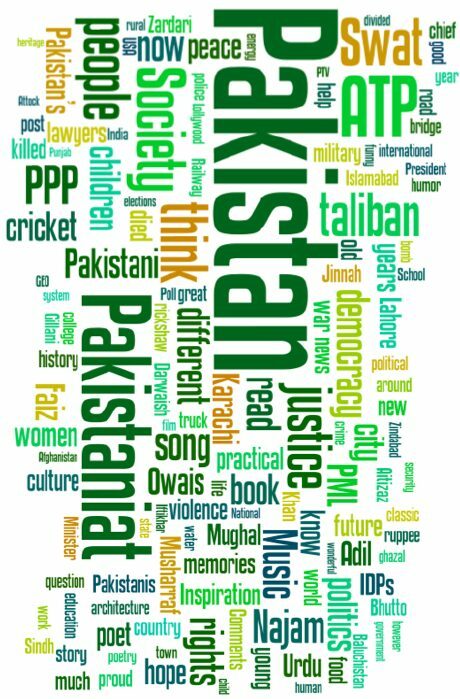 At a recent function organised by the Pakistan Embassy in Paris which saw the launch of the Pak-France cultural forum, professor Welcomme delivered a lecture on his recent find. He also thanked the Nawab of Bugti, the Bugti people and the University of Balochistan for extending all assistance to the French team. The Nawab of Bugti convinced other tribes to allow the team to work in the area and also provided material and technical assistance to Professor Welcomme‘s team. The latest news about Baluchitherium came last week when in early March 2008, more pieces of Baluchitherium have been excavated in Dera Bugti area. I read this update in Jang’s latest news feed but didn’t see the detailed news on it in the regular paper. 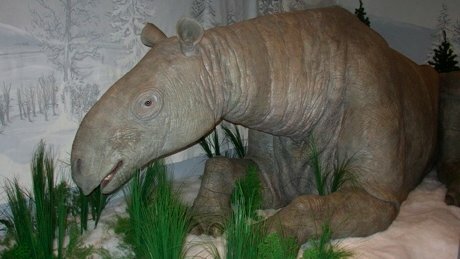 Is There A Baluchitherium Museum in Pakistan? The short answer in NO. But then I am not familiar either with what has been done at Government level to help finding and preserving Baluchitherium fossils. A National museum displaying some fossils of this mammal who roamed the land of Pakistan before us is the need of the hour. Does any of our readers know about any effort in this regard? If we come to know of any effort, we’ll update this paragraph here with the new information. 1. Baluchitherium is a Van Halen instrumental from their 10th studio album, Balance (album). 2. Baluchitherium is also the name of a monster appearing in the computer game NetHack. It would be interesting to read Job 40 and 41, because of its similarity. Behold now behemoth (great beast), which I made with thee. In his neck remained strength. He moved his tail like a cedar. He eats grass as an ox. ooooo really ya know i lived in dera bugti well a little further in a place called perko and lol now that i’m here it is not at all shocking for i have even seen precious stones lying on da ground and could never pick them!!!! In Indonesia with a small size is still alive in Sulawesi island, Baluchiterium like Tapir, its size was the size of the goat.